AVCTL DIV IV WRESTLING HONORS ANNOUNCED! 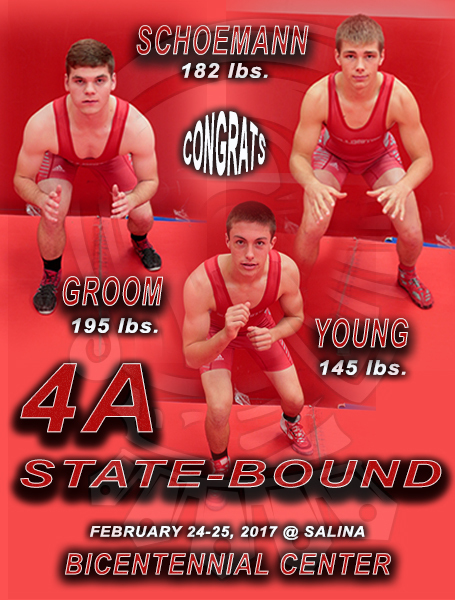 Read more about AVCTL DIV IV WRESTLING HONORS ANNOUNCED! The 15TH ANNUAL KINGMAN EAGLE CLASSIC BASKETBALL TOURNAMENT wrapped up on Saturday with the Wellington teams playing earlier in the day than probably most people thought originally they would. Losses on Day #2 (Friday) eliminated the chances for both the Varsity Girls and Varsity Boys to make any Championship Game appearances this go-round. The boys have won this tournament "3" times and the girls "4" times since it's beginnings shortly after the turn of the century. Both will have to wait another year to add to the column of successes. Carter Burnett, 76 lb. Wellington wrestling guru finished the season in about as sweet a way as you can - UNDEFEATED and STATE CHAMPION!! Awesome & Awesome!! Congratulations Carter on a job well done!! Carter won by technical fall (15-0) in the championship match after going 3-0 on Friday. SWEET! Season DUAL Cumulative Totals - WMS 832 OPPONENTS 327 - KABAM! The Wellington Knight 7/8 Wrestling Squad wrapped up their regular season Tuesday evening at Ark City in double-dual action with El Dorado and Winfield...and like they had done TEN times before, came out on top! Read more about Season DUAL Cumulative Totals - WMS 832 OPPONENTS 327 - KABAM! IT'S GYM JAMMIN' TIME Crusader / Knight Sports Fans! Plenty of BIG TIME sports action this coming week and you only have to drive a few blocks to be a big part of it! Read more about IT'S GYM JAMMIN' TIME Crusader / Knight Sports Fans!